On Monday, Oct. 30, the light rail platform at the Washington County Fair Complex was the same as it is most weeknights — relatively empty. Two men casually waited for the MAX train. One stood just inside the covered waiting area, wearing large headphones to block out the noise from nearby Hillsboro Airport. Across the tracks, another man pushed a bicycle across the tracks on the eastern edge of the station, waiting for an eastbound train to Beaverton. After a few minutes, a white bus pulled up to the curb and a dozen or so employees, most wearing Intel identification badges, piled out and scurried to the center of the station. When the train arrived moments later, the commuters jumped on board and were whisked away, leaving the platform empty once again. Four years from now, this scene could look very different. TriMet, the Portland area's public transit agency, is considering expanding its Red Line light rail service to the fair complex, connecting Hillsboro and Portland International Airport for the first time, as early as 2021. Since 2003, TriMet's Red Line has taken passengers from PDX into Beaverton, but commuters living west of Beaverton Transit Center have had to catch a connecting bus or Blue Line train — which can take passengers as far as downtown Hillsboro. A handful of Red Line trains do run to Hillsboro during rush hour on weekdays, but they are not included in scheduled service. During off-hours, that can mean a long, cold wait. TriMet's plans to extend the MAX line into Hillsboro would offer a no-transfer airport connection to western Washington County. The plan would revamp stations at PDX, which would help TriMet handle tricky timing at its Gateway Transit Center in Portland during peak usage. But the project would only get federal funding if it also offered service to more passengers on the rapidly-growing west side. Many MAX commuters said they hoped the additional line would mean more frequent service to Washington County. "They're supposed to be every 15 minutes, but it doesn't feel like that out here," said commuter Kevin McCowan. Lorie Gookin commutes five days a week from the fair complex station. She takes light rail to Beaverton, where she jumps on a bus and rides to Oregon Health & Science University hospital. She said additional trains on her usual route would be a benefit. "I've been doing it for seven years; the MAX and the bus," She said. "It's a three-hour commute to go 13 miles because there's no parking at OHSU." The project would add Red Line service at 10 stations: Beaverton Central, Merlo Road, Elmonia, Willow Creek, Quatama, Orenco, Hawthorn Farm and the Washington County Fair Complex. TriMet officials say they plan to purchase eight more rail cars and lay some additional track for switching purposes, along with a new operator break facility. On the east side, TriMet would convert single-track sections to double-track sections at Gateway and PDX. At Gateway, TriMet would reconfigure the Red Line to approach the station from the north, instead of the current loop and approach from the south. TriMet would add a second platform for Red Line trains and expand its storage facility in Gresham. The changes would allow TriMet more time to recover from delays on the Red Line, which often reverberate across the entire system. 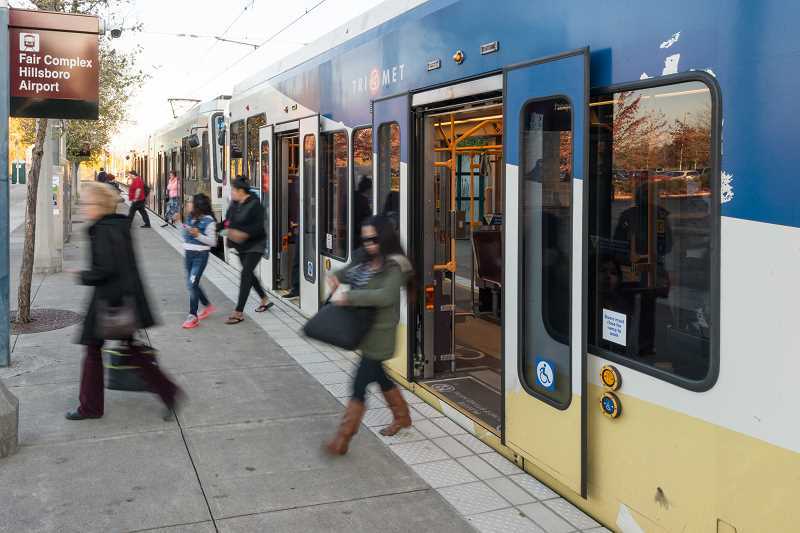 Trains need a two-minute window between one another to operate safely, said Alan Lehto, TriMet Director of Business Planning & Asset Management. The Gateway station is often pushing that limit during rush hour. While it wouldn't extend to downtown Hillsboro, the proposed extension passes close to several major job centers: Intel's Hawthorn Farm campus in Hillsboro and the Nike World Headquarters near Beaverton. Lehto said TriMet has heard from both major employers that delays through downtown Portland inhibit employees from taking light rail. The expansion might not be the only change coming to the county fair complex. The county is moving ahead with its own plans to build an 83,000-square-foot multipurpose events center at the fairgrounds, designed to host conventions, trade shows and wedding receptions. The building would feature conference rooms, a gallery and a nearly 46,000-square-foot events hall. In August, Hillsboro approved a local lodging tax, with funds directed toward events-center construction, which is expected to wrap in 2019. "When you think about what is happening at the fairgrounds — if it all does happen — the fairgrounds is going to be a major user of light rail. So it will be nice that TriMet can do that," said Andy Duyck, chairman of the Washington County Board of Commissioners. "Some big things are in the works, all of which would drive a lot of traffic to the fairgrounds." Duyck has floated the idea of adding parking garage at the fair complex, which would expand on the pair of TriMet parking lots currently available. Hillsboro Planning Department Director Colin Cooper said Hillsboro's government would love to see the expansion happen. "TriMet has been discussing the potential extension of the Red Line for a number of years with the city and other community partners," he said. "The city has been supportive of any increase in public transit service for the Westside," he said. If TriMet moves forward with expansion, Lehto said, there could be as much as $100 million in federal dollars in store for the project — close to a 50/50 split with local funding, Lehto said. Lehto said TriMet is looking at staggered delivery of various elements of the project in 2021 and 2022. A broader public outreach should be underway later this fall, he said, with application for federal funds coming next year.